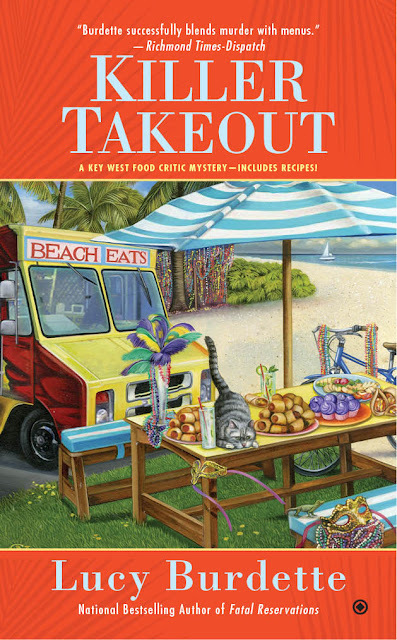 LUCY BURDETTE: I told you during the last What We’re Writing week that I was working on KILLER TAKEOUT, the seventh Key West food critic mystery, coming out April 5, 2016. This book takes place during Fantasy Fest, a giant, crazy costume party running over the week leading up to Halloween. While I was doing the research for this, John and I participated in one of my favorite Key West events, the zombie bike ride. And where I go, of course, Hayley goes. We went to get our faces painted by a professional face painter—Hayley does too. 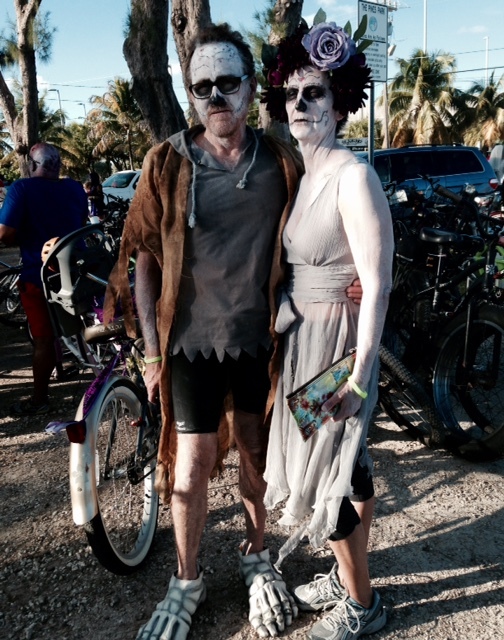 This is a very crazy scene—10,000 people on bikes, most of them dressed up and made up like zombies. I made the decision early in the draft that the crime should occur during the bike ride. I had no problem setting this up. The questions came later, when I was trying to figure out what kind of murderer would attempt such a thing in an enormous crowd—and how! And why? You might think it ridiculous that someone would begin writing without those answers, but I assure you that I do it every time. And interesting to me that Nathan Bransford (former literary agent, now novelist, and yes, the namesake for Hayley’s detective heartthrob) addressed this very question in his recent blog. His advice (which thank goodness I was already stumbling through) is first to identify what you’re trying to solve, and then create some structure around it. What needs to happen before you can reach that solution? Break it all down into manageable steps and it starts to feel possible. We got onto our bikes and began to pedal. The crowd pressed in on either side. I dodged a wobbly elder zombie on a three-wheel bike to my left and three tricycles loaded with the Andrews sisters zombies on my right. A radio in one of their baskets played a tinny version of Boogie Woogie Bugle Boy. I snapped photos to the left and the right, and held my phone up to take a short video of the crowd following behind me. Two very drunk zombie girls in black dresses whose hems fluttered dangerously close to their bike spokes approached from either side of me ringing their warning bells. “Zombie on the left!” cried one. “Zombie on the right!” said the other. “Zombie down!” came another call from behind. “These people are having too much fun. They have to learn to pace themselves over the week,” I muttered to Connie. “You go on ahead, I think it’s safer to ride single file.” Not that I hadn't done my share of partying back in the day, but I'd learned my lesson. There was a good reason that one of the liquor stores in town was called The Lost Weekend. I spurted ahead of the others, staying to the right of the pack, concentrating on not getting run into the curb. “Zombie down!” echoed a call through the crowd. This time, the “zombie down” was not a cry of wolf. I stopped riding and spun around to see what was wrong. A zombie was splayed out on the pavement. The two tipsy girls swerved past, barely missing the figure in the road. “Zombie down!” the shouts grew louder and more shrill as the costumed revelers passed their call up the slow-moving bicycle cavalcade to the front of the parade, like a twisted version of telephone. As none of the zombies around me were stopping to help, I got off my bike and crouched beside the person on the ground. 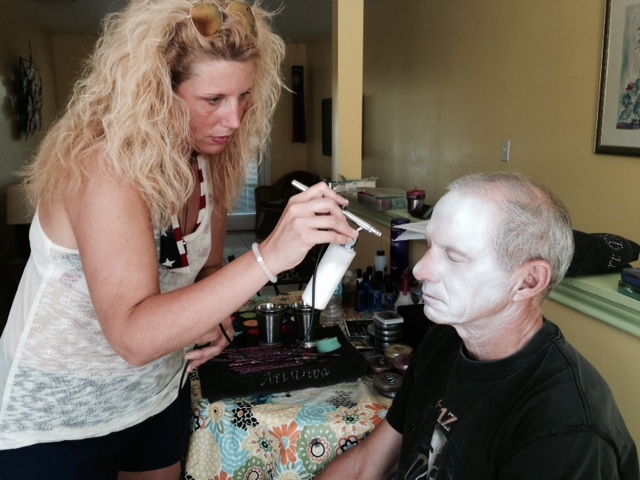 Her face was painted mostly white, with patches of black and red almost the opposite of my pattern. She was dressed in a flowing white gown that made the most of her buxom figure, streaked with the requisite blood stains and red glitter. Her headdress, which looked like a Cinderella tiara, zombie-style, had been knocked off her head and scattered a foot away. I snatched up the crown so it wouldn’t get trampled and shouted over the noise around us. She answered with a low groan. My gaze flicked over her body, her arms splayed out, her legs akimbo. So much fake blood had been painted on the costume that it was hard to tell if she was really in trouble. I took her hand, which was cool, bordering on icy. Her pulse was racing. And then I noticed a froth of red in the corner of her mouth. This problem was no fake. Killer Takeout will be out on April 5, 2016, but you can pre-order it now! And thank you again to my friend Hallie for filling the hole! What a treat, Lucy; thanks for sharing this with us . . . so glad you're feeling better. This is so much fun although I have to admit thought of a Zombie bike ride made me laugh. Editor Yoda is too cute, and he certainly looks comfortable there in the midst of all those notes! I love the scene, Lucy/Roberta! What a perfect event to stage a murder in. All that fake blood. Another great cover, too. And hope you're over the vertigo. Bad vertigo - don't come back. Zombie down! My new favorite warning for any bodies in the road or roast chickens that slide off the platter... The treat here is ours, Lucy! What Edith said: Bad vertigo, don't come back. thanks guys, I did love the zombie ride. we won't make it this year, but next time we do we're going to spend more creative energy on the costumes. They were amazing! and there wasn't even a prize!! and thanks on the vertigo--I hope to ward it off because it was one of the most unpleasant things I've ever experienced! This is so great--love it, Lucy! The vertigo thing is so scary. The one thing we think we can count on in life is that we'll know which way is up, and that it will stay that way, right? Sending much love..
What a great scene. I'm definitely adding "zombie down" to my lexicon. Having battled vertigo on and off for eight years, I sympathize. Yes, bad vertigo - go away and don't come back! Looks like your usual highly energetic and wonderful prose! I don't take you for granted at all but have come to expect nothing less than fun and adventure. A zombie covered with fake blood . . . and some real blood! Thanks Hank and Mary and Brenda and Denise! I'm sorry about your vertigo too Mary. It's downright unpleasant to say the least. Denise your comment reminded me of how hard it was to decide what actually happens in that scene. Because how couldsomeone with a knife or gone getaway unnoticed? And more to the point, why choose that moment? The opening spark for a book is so exciting, when all the possibilities are open. And Zombies on bikes? Wow, fun and weird. It's going to be fabulous. Fun post! I battle vertigo, too, and have some good exercises that have been helping lately. I WANT to do that bike ride! Without the Zombie Down part, I think. Great plot beginning. It was a delight. Thanks so much for hosting me!I truly am in awe of all the Jungle Red Writers. Number seven! Wow, time flies when you're having fun, and I have so much fun reading the Haley Snow series! Lucy, that you have taken one of my favorite places as a setting and given me an amazing mystery series to read with fantastic characters, well, it puts me in a very happy place. Your integration of the Key West festivities into the stories is brilliant. Can you tell that I love your series? I haven't been to Fantasy Fest, but with my daughter having lived there for a year, she has described it to me, and, of course, I've seen pictures of this massive celebration. And, I would dearly love to see the Zombie bike ride. The next best thing will be to read about these in Killer Takeout. And, I'm a big fan of manageable steps. WOW! I didn't even recognize you! Looks like you and John had a lot of fun. I especially loved the "brainy" zombies! This week I realized I'm missing one of your books. I've read them all but forgot that I had borrowed one from the library. I'll need to get out to the store and get my own copy ASAP. I am looking forward to your next one. I do hope you're feeling better. You know you have my sympathy! Thanks Kathy! was your daughter a fan of Fantasy Fest? We were mixed about it! But not the bike ride, we loved that. Deb, thanks so much. I wasn't in one of the pix--I'll post the one of me next time. It's truly frightening! And thanks for filling in your collection and for good health wishes. Deb C--I keep wondering if I should let Nathan Bransford know he has a doppelganger...not sure if he'd be amused or not. Thank you too for good health wishes. I am hanging on to all of them! Lucy, I know that my daughter enjoyed all of the costumes, and she and her boyfriend dressed up their pug. That's one of the many things I love about Key West, how the dogs are just part of the fun and life. This is going to be fun (not the vertigo, though, not fun at all). I love that Hayley is always willing to help. I know it's what gets her in trouble, but I believe it also is why she has backup whenever she needs it. Such an adventure! Hugs!